CAD is treated by control of exercise and administration of nitroglycerin to dilate coronary vessels. Other drugs may be used to regulate the heartbeat, strengthen the force of heart contraction, or prevent formation of blood clots. Patients with severe cases of CAD may be candidates for angioplasty, surgical dilatation of the blocked vessel by means of a catheter, technically called percutaneous transluminal coronary angioplasty (PTCA) (Fig. 9-10). 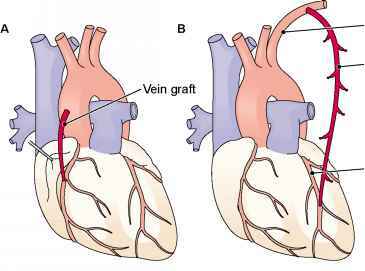 If further intervention is required, the blocked vessel may be surgically bypassed with a vascular graft (Fig. 9-11). In this procedure, known as a coronary artery bypass graft (CABG), another vessel or a piece of another vessel, usually the saphenous vein of the leg or the left internal mammary artery, is used to carry blood from the aorta to a point past the obstruction in a coronary vessel. CAD is diagnosed by electrocardiography (ECG), study of the electrical impulses given off by the heart as it functions, stress tests, coronary angiography (imaging), echocardiography, and other tests. FIGURE 9-10. Coronary angioplasty (PTCA). 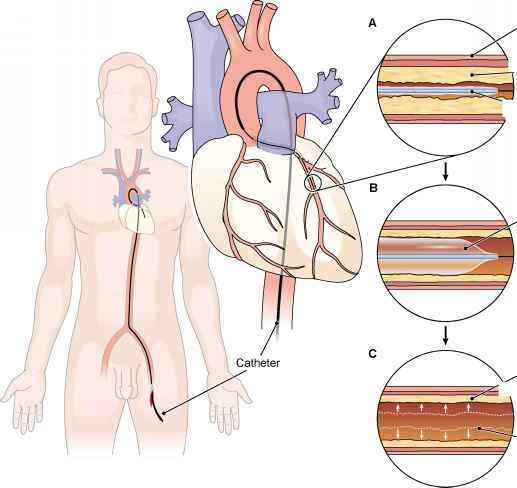 (A) A guide catheter is threaded into the coronary artery. (B) A balloon catheter is inserted through the occlusion. (C) The balloon is inflated and deflated until plaque is flattened and the vessel is opened. FIGURE 9-11. Coronary artery bypass graft (CABG). (A) A segment of the saphenous vein carries blood from the aorta to a part of the right coronary artery that is distal to an occlusion. 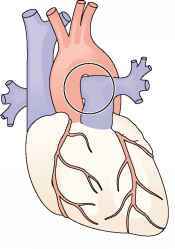 (B) The mammary artery is used to bypass an obstruction in the left anterior descending (LAD) coronary artery. Degenerative changes in the arteries predispose a person to thrombosis and sudden occlusion (obstruction) of a coronary artery. The resultant area of myocardial necrosis is termed an infarct (Fig. 9-12), and the process is known as myocardial infarction (MI), the "heart attack" that may cause sudden death. Symptoms of MI include pain over the heart (precordial pain) or upper part of the abdomen (epigastric pain) that may extend to the jaw or arms, pallor (paleness), diaphoresis, nausea, and dyspnea. 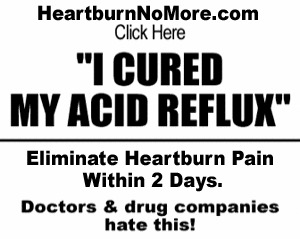 There may be a burning sensation similar to indigestion or heartburn. MI is diagnosed by electrocardiography, by measurement of certain enzymes (CK, LDH, AST) released into the blood from the damaged heart muscle and by a variety of other methods described later in this chapter. Patient outcome is based on the degree of damage and early treatment to dissolve the clot and re-establish normal heart rhythm. Arrhythmia is any irregularity of heart rhythm, such as a higher- or lower-than-average heart rate, extra beats, or an alteration in the pattern of the beat. Bradycardia is a slower-than-average rate, and tachycardia is a higher-than-average rate. In cases of MI, there is often fibrillation, an extremely rapid, ineffective beating of the heart. MI may also result in heart block, an interruption in the electrical conduction system of the heart (Fig. 9-13). Cardioversion is the general term for restoration of a normal heart rhythm, either by drugs or application of electric current. Several devices are in use for electrical defibrillation. If, for any reason, the SA node is not generating a normal heartbeat, an artificial pacemaker (Fig. 9-14) may be implanted in the chest to regulate the beat. 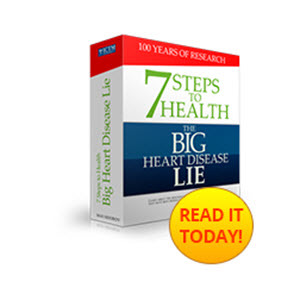 The general term heart failure refers to any condition in which the heart fails to empty effectively. The resulting increased pressure in the venous system leads to edema, often in the lungs (pulmonary edema), and justifies the description congestive heart failure (CHF). Other symptoms of congestive heart failure are cyanosis, dyspnea, and syncope. Heart failure is one cause of shock, a severe disturbance in the circulatory system resulting in inadequate delivery of blood to the tissues. 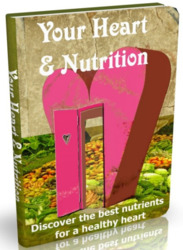 Heart failure is treated with rest, drugs to strengthen heart contractions, diuretics to eliminate fluid, and restriction of salt in the diet. FIGURE 9-13. 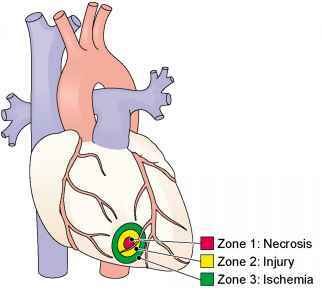 Potential sites for heart block in the atrioventricular (AV) portion of the heart's conduction system. FIGURE 9-14. 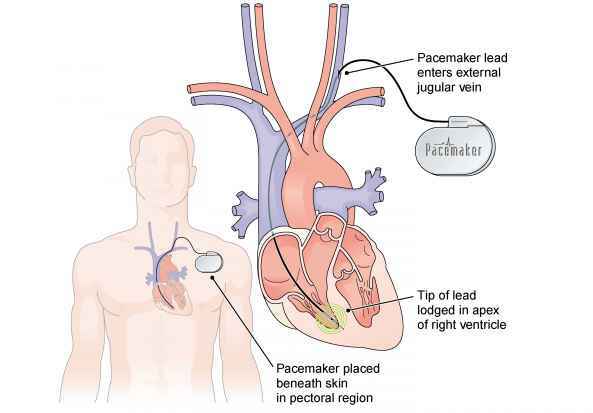 Placement of a pacemaker. A congenital defect is any defect that is present at birth. The most common type of congenital heart defect is a hole in the septum (wall) that separates the atria or the ventricles. The result of a septal defect is that blood is shunted from the left to the right side of the heart and goes back to the lungs instead of out to the body. The heart has to work harder to meet the body's need for oxygen. Symptoms of septal defect include cyanosis (leading to the description "blue baby"), syncope, and clubbing of the fingers. Most such congenital defects can be corrected surgically. Another type of congenital defect is malformation of a heart valve. Failure of a valve to open or close properly is evidenced by a murmur, an abnormal sound heard as the heart cycles. Still other congenital defects result from failure of fetal modifications to convert to their adult form at birth. In patent ductus arteriosus (Fig. 9-15), a vessel present in the fetus to bypass the lungs fails to close at birth. Blood can then flow from the aorta to the pulmonary artery and return to the lungs. FIGURE 9-15. 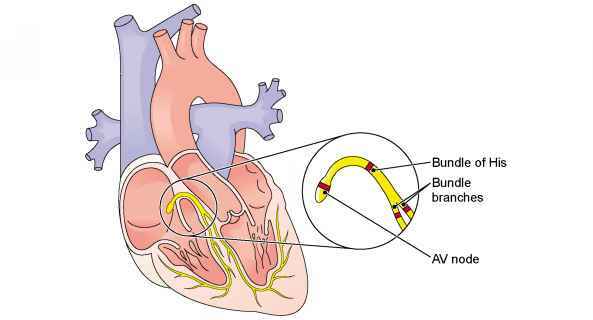 Patent ductus arteriosus. (A) Normal. (B) The ductus arteriosus fails to close. procedures such as dental cleaning. Severe cases of rheumatic heart disease may require surgical correction or even valve replacement. The incidence of rheumatic heart disease has declined with the use of antibiotics.